Estrogen is involved in both normal mammary development and in breast carcinogenesis. A family history of disease and exposure to estrogen are major risk factors for developing breast cancer. Estrogen exerts its biological effects through binding to the estrogen receptors, estrogen receptor alpha (ESR1) and the more recently discovered estrogen receptor beta (ESR2). Genetic variation in genes involved in estrogen biosynthesis, metabolism and signal transduction have been suggested to play a role in breast cancer risk. We therefore tested the hypothesis that common genetic variants of the ESR2 gene may be associated with increased risk for breast cancer and this risk may vary between breast cancer groups. We investigated three common ESR2 polymorphisms, rs1256049 (G1082A), rs4986938 (G1730A) and rs928554 (Cx+56 A→G) for association to breast cancer risk. 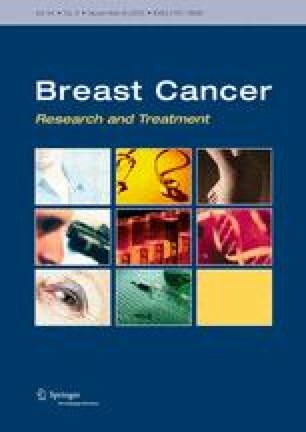 A total of 723 breast cancer cases and 480 controls were included in the study. Of the breast cancer cases, 323 were sporadic and 400 were familial, the familial cases were further divided into familial high-risk and familial low-risk breast cancer cases. We found no overall statistically significant association for any of the single polymorphisms studied. Haplotype analysis suggested one haplotype associated with increased risk in sporadic breast cancer patients (OR = 3.0, p = 0.03). Further analysis is needed to elucidate the role of estrogen receptor beta in breast cancer susceptibility.